The state’s water is at risk from 9,100 leaking underground storage tanks, second most in the United States. Click to open the interactive Google Fusion Tables map and explore Michigan’s LUST sites. Just before reaching the stunning vista of Grand Traverse Bay, motorists driving into Traverse City on U.S. 31 pass an abandoned gas station that illustrates one of Michigan’s most serious but undervalued environmental problems. 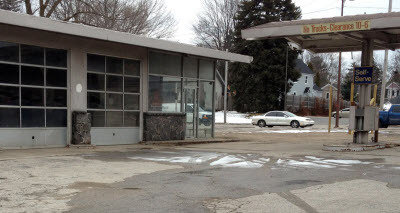 The former Union 76 station at the corner of U.S. 31 and West Front Street sits atop a large plume of contaminated groundwater that was poisoned decades ago by four gas stations that operated at the west entrance to downtown Traverse City. Gasoline from leaking underground storage tanks at the gas stations, known as LUSTs, contaminated soil, groundwater, and a nearby creek — and nearly reached the scenic bay. State officials and the gas station owners fought for years over a cleanup, but much of the pollution remains. Purge wells have contained the plume, but the problem is far from resolved. The situation is not unique to Traverse City. No gas above ground. This former gas station at the western end of downtown Traverse City is atop a plume of pollution that started with leaking underground storage tanks. Michigan has thousands of such sites — and the one state fund for financing cleanup is set to expire at end of 2012. Michigan has 9,100 polluted LUST sites — second most in the United States — where fuel leaks have contaminated soils and groundwater, and, in some cases, fouled drinking water wells and surface waters. At least 1,440 of those LUST sites pose an immediate risk to human health, according to the U.S. Environmental Protection Agency. Underground storage tanks cause problems when corrosion and rust eats away at aging metal tanks and allows gasoline or other chemicals to seep into soils and groundwater. Federal regulations enacted in the 1980s require gas stations to replace leaky metal tanks with more durable fiberglass tanks. Gas stations also must install leak detection systems, which are designed to prevent small leaks from becoming a major environmental problem. Pollution will fester at many of those sites for years, if not decades, because Michigan’s LUST cleanup program has gone off the rails: Completed cleanups are down 80 percent from the late 1990s; the average cost of a cleanup here is $US 400,000, four times the national average; and Michigan has one of the nation’s worst rates for completing cleanups, according to government data. President of PM Environmental, Inc.
At current rates, cleaning up the 4,500 orphan LUST sites in Michigan — where private property owners have not been held liable — would take the DEQ 90 years and cost $US 1.8 billion, according to state data. Budget cuts, a weakened environmental liability standard, and changing cleanup criteria have crippled a once-heralded program that forged cleanups at roughly 12,000 polluted LUST sites before it slowed to a crawl over the past five years. Changes to Michigan’s environmental liability standard in 1995 made it harder for state officials to force privately funded cleanups. The current standard assigns liability to a person or business that caused the pollution, not to property owners. That has left the state with the cleanup bill at 4,500 so-called “orphan” sites — properties where the DEQ could not pin liability on a private party. The collapse of a state cleanup fund for LUST sites left the state, as well as many private property owners and businesses, without a pot of money to help pay for cleanups. State lawmakers in recent years took most of the $US 56 million annually generated by a 7/8th of 1-cent gas tax, which was supposed to be used to clean up LUST sites, and used it to help balance the state budget. The DEQ in 2007 enacted policies that exceeded cleanup standards the Legislature approved in 1994. Industry officials said the 2007 standards made it extremely difficult to get a site declared clean. “There are definitely real problems out there but not at all 9,000 sites,” said Peter Bosanic, president of Lansing-based PM Environmental, Inc. His firm works on LUST cleanups in several states. Bosanic said the DEQ’s 2007 rule forced the agency to move away from risk-based cleanups, which allow some pollution to remain in the ground, provided there is no risk of humans encountering the contamination. Risk-based standards to guide cleanups at LUST sites are used by 36 states, according to the Michigan Petroleum Association. A package of bills moving through the Michigan Legislature would overhaul the LUST cleanup program. One of the major changes would require the DEQ to allow risk-based cleanups. As it stands now, meeting the state’s cleanup standard for LUST sites is like trying to hit a “moving target,” according to industry officials. “The increasingly complex environmental compliance requirements and the inability to close LUST sites are inhibiting job creation and business growth in Michigan,” said Craig Hoppen, chairman of the Michigan Petroleum Association/Michigan Association of Convenience Stores, in a recent press release. Hoppen is president of J & H Oil Co. in Grand Rapids, which owns dozens of gas stations and convenience stores. Couture — who worked for the DEQ in the 1990s, when the agency developed risk-based cleanup standards — said the LUST program has strayed from those criteria. “It’s clear to me that there had been some issues in the program that had resulted in stalling site closures,” Couture said. But Couture added that the number of LUST sites in Michigan is a serious problem that warrants action. “We have nearly 10,000 sites — it’s a big concern,” she said. James Clift, policy director for the Michigan Environmental Council, an advocacy group, said leaking underground storage tanks are a more serious threats in Michigan than elsewhere, due to the state’s abundant waters and the fact that half the state’s residents rely on groundwater for drinking water. More than 95 percent of the sites in Michigan have contaminated groundwater, according to government data. Clift said the state’s LUST cleanup program is underfunded and understaffed. But he said the agency also has become “risk averse” in recent years when dealing with pollution sites. “At some point it’s not worth the money (to keep cleaning up a site), especially if there is no exposure pathway that puts people at risk,” Clift said. Efforts to deal with LUSTs in Michigan have faltered in recent years, with the number of cleanups completed down by 90 percent since 1997. Experts blame a lack of money committed to the problem. And what few dollars that are committed will disappear, if the Legislature allows the program’s funding source to expire at the end of the year.. The Legislature’s diversion of gas tax revenue intended for LUST cleanups has left the DEQ with a maximum of $US 20 million annually for the program in recent years. From 2005 to 2007, the agency received less than $US 5 million annually in gas tax revenue for the program, according to state data. Michigan needs $US 177 million annually to reduce the mushrooming inventory of LUST sites, which grows by about 300 annually, according to DEQ officials. The number of completed cleanups at LUST sites has dropped dramatically over the past decade. In the five years after the Legislature approved risk-based cleanup standards in 1995, more than 1,000 LUST cleanups were completed annually. That slowed to an average of 200 completed cleanups over the past five years, according to government data. Michigan’s Governor Rick Snyder has proposed $US 30 million in funding for the LUST program in 2013. But, given the size of the LUST problem, an additional $US 10 million is a relative drop in the bucket. Without a large infusion of cash and revamped cleanup criteria, many contaminated LUST sites will linger for years to come, according a federal review of Michigan’s program. That doesn’t bode well for hundreds of communities facing the problem. Chuck Korn, who is chairman of Grand Traverse County’s Brownfield Redevelopment Authority and supervisor of Garfield Township, said he was frustrated by the state’s inability to force a cleanup at the contaminated LUST sites near Grand Traverse Bay. The county recently decided to take over the project in an attempt to recover cleanup costs. Korn said state lawmakers and Snyder must find a proper balance between environmental protection and economic development. Jeff Alexander is owner of J. Alexander Communications LLC, as well as a writer and media consultant at the National Wildlife Federation. He is a former staff writer for The Muskegon Chronicle. This article was originally published by Bridge Magazine on March 27, 2012, and has been republished here with permission from The Center for Michigan.